Biography*: Pybba (570?–606/615) (also Pibba, Wibba, Wybba) was an early King of Mercia. He was the son of Creoda and father of Penda and Eowa. His dates are sometimes given in genealogies as birth in 570, the beginning of his reign in 593, and death in either 606 or 615, but with no apparent evidence; the Anglo-Saxon Chronicle just mentions him as father of Penda, with no further detail. Pybba is said by the Historia Brittonum to have had 12 sons. Cearl, a Mercian king, is mentioned by Bede, and may have been Pybba's successor, but his relationship to Pybba, if any, is unknown. Pybba's son Penda eventually became king; the Chronicle gives the date of this as 626, although Bede suggests it was not until after the battle of Hatfield Chase in 633. Besides Penda and Eowa (who the author of the Historia Brittonum said were the sons of Pybba who were the best known to him), Pybba also apparently had a son named Coenwalh. Every king from Penda until Ceolwulf, who was deposed in 823, was said to be a descendant of Pybba, either through Penda, Eowa, or Coenwalh (perhaps excluding Beornrad, who ruled briefly and whose background is unknown). Biography*: Creoda (Cryda or Crida, 6th century) may have been the first king of the Anglo-Saxon kingdom of Mercia, ruling toward the end of the 6th century. The suggestion that Creoda was a king of Mercia is to be found in the Historia Anglorum, which was written by Henry of Huntingdon in the first half of the 12th century. Creoda's presumed death was reported by Henry of Huntingdon as occurring in 593, but appears to be based on a confusion, because in that year the death of a man called Crida is specified but the context suggests that the dying man was West Saxon and not Mercian. Biography*: Gilbert, son of Magnus (1210–1256) was Earl (Jarl) of Orkney and Caithness. [S746] Wikipedia, online http://Wikipedia.com, http://en.wikipedia.org/wiki/Magnus_II,_Earl_of_Orkney. Biography*: Magnus II (d 1239) was Earl (Jarl) of Orkney. Biography*: Richard FitzAlan, 10th Earl of Arundel and 8th Earl of Surrey (c. 1306/1313 – 24 January 1376) was an English nobleman and medieval military leader. Richard's birth date was uncertain perhaps 1313 or maybe 1306 in Sussex, England. FitzAlan was the eldest son of Edmund FitzAlan, 9th Earl of Arundel (8th Earl of Arundel per Ancestral Roots), and his wife Alice de Warenne. His maternal grandparents were William de Warenne and Joan de Vere. William was the only son of John de Warenne, 6th Earl of Surrey (himself son of Maud Marshal by her second marriage), and his wife Alice de Lusignan (d. 1356), half-sister of Henry III of England. Around 1321, FitzAlan's father allied with King Edward II's favorites, Hugh le Despenser, 1st Earl of Winchester and his namesake son, and Richard was married to Isabel le Despenser, daughter of Hugh the Younger. Fortune turned against the Despenser party, and on 17 November 1326, FitzAlan's father was executed, and he did not succeed to his father's estates or titles. However, political conditions had changed by 1330, and over the next few years Richard was gradually able to reacquire the Earldom of Arundel as well as the great estates his father had held in Sussex and in the Welsh Marches. Beyond this, in 1334 he was made Justiciar of North Wales (later his term in this office was made for life), High Sheriff of Caernarvonshire for life and Governor of Caernarfon Castle. He was one of the most trusted supporters of Edward the Black Prince in Wales. Despite his high offices in Wales, in the following decades Arundel spent much of his time fighting in Scotland (during the Second Wars of Scottish Independence) and France (during the Hundred Years' War). In 1337, Arundel was made Joint Commander of the English army in the north, and the next year he was made the sole Commander. In 1340 he fought at the Battle of Sluys, and then at the siege of Tournai. After a short term as Warden of the Scottish Marches, he returned to the continent, where he fought in a number of campaigns, and was appointed Joint Lieutenant of Aquitaine in 1340. Arundel was one of the three principal English commanders at the Battle of Crécy. He spent much of the following years on various military campaigns and diplomatic missions. In a campaign of 1375, at the end of his life, he destroyed the harbour of Roscoff. In 1347, he succeeded to the Earldom of Surrey (or Warenne), which even further increased his great wealth. (He did not however use the additional title until after the death of the Dowager Countess of Surrey in 1361.) He made very large loans to King Edward III but even so on his death left behind a great sum in hard cash. He married firstly February 9, 1321 at Havering-atte-Bower, Isabel le Despenser (born 1312). At that time, the future earl was fifteen (or eight), and his bride nine. He later repudiated this bride, and was granted an annulment by Pope Clement VI in December 1344 on the grounds that he had been underaged and unwilling. He had a son Edmund (b. 1327) when he was twenty-one (or fourteen) and his wife fifteen; this son was bastardized by the annulment. His second wife, whom he married on 5 April 1345, was a young widow Eleanor of Lancaster, the second youngest daughter and sixth child of Henry, 3rd Earl of Lancaster and Maud Chaworth; by Papal dispensation he was allowed to marry his first wife's first cousin by their common grandmother Isabella de Beauchamp. Eleanor was the widow of John de Beaumont, 2nd Lord Beaumont. The king, Edward III, himself a kinsman of both wives, attended this second marriage. By now, the Earl of Arundel had rebuilt the family wealth and was apparently a major financier of the Crown, and financial sweeteners may have been used to reconcile both the Church and the Crown. Sir Edmund de Arundel, knt (b ca 1327; d 1376-1382), bastardized by the annulment. Edmund was nevertheless knighted, married at the age of twenty, in the summer of 1347 Sybil de Montacute, a younger daughter of William Montacute, 1st Earl of Salisbury and Catherine Grandison, whose elder sister Elizabeth was married to his maternal uncle (the uncle may have arranged this marriage). Edmund protested his bastardization bitterly in 1347, but was apparently ignored. After his father's death in 1376, Edmund disputed his half-brother Richard's inheritance of the earldom and associated lands and titles in 1376 and apparently tried to claim the six manors allotted to his deceased mother. He was imprisoned in the Tower of London in 1377, and finally freed through the intervention of two of his brothers-in-law (his wife's brother John de Montacute and the second husband of Elizabeth de Montacute, Lady Le Despencer). Philippa de Arundel (died 18 May 1452), married (as his 2nd wife) Sir Richard Sergeaux, Knt, of Colquite, Cornwall. A Victorian historical novel ascribes the following five children to her: a) Richard, born December 21, 1376, and died issueless, June 24, 1396; b) Elizabeth, born 1379, wife of Sir William Marny; c) Philippa, born 1381, wife of Robert Passele; d) Alice, born at Kilquyt, September 1, 1384, wife of Guy de Saint Albino this ; e) Joan, born 1393, died February 21, 1400. "Philippa became a widow, September 30, 1393, and died September 13, 1399." Mary (died 29 Aug 1396), married John le Strange, 4th Lord Blackmere (from Genealogy of Fitzalans). Richard FitzAlan, 11th Earl of Arundel, who succeeded him as 11th Earl of Arundel as his "eldest legitimate" son. John FitzAlan, 1st Baron Arundel, 1st Baron Maltravers, who was a Marshall of England, and drowned in 1379. Lady Joan FitzAlan (1348 - 7 April 1419) who married Humphrey de Bohun, 7th Earl of Hereford. They were the maternal grandparents of Henry V of England through their daughter Mary de Bohun. Lady Alice FitzAlan (1350 - 17 March 1416), who married Thomas Holland, 2nd Earl of Kent, uterine brother of King Richard II. They were ancestors to Queen consorts Anne Neville (wife of King Richard III), Elizabeth of York (wife of King Henry VII), and Catherine Parr (wife of King Henry VIII). Lady Eleanor Fitzalan (1356 - before 1366). The current Dukes of Norfolk descend from Lady Mary, Duchess of Norfolk, a daughter and co-heiress of Henry FitzAlan, 19th Earl of Arundel; the 19th Earl descended from John FitzAlan, 1st Baron Arundel. Richard died on 24 January 1376 in Sussex, England. (Another source says he wrote his will on 5 December 1375, and died on 14 January 1376 at Arundel Castle).. In his will, he mentioned his three surviving sons by his second wife, his two surviving daughters Joan, Dowager Countess of Hereford and Alice, Countess of Kent, his grandchildren by his second son John, etc., but left out his bastardized eldest son Edmund. 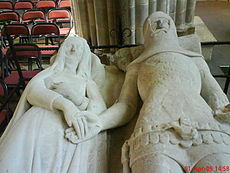 The memorial effigies attributed to Richard FitzAlan and his second wife Eleanor of Lancaster in Chichester Cathedral are the subject of the poem "An Arundel Tomb" by Philip Larkin. [S746] Wikipedia, online http://Wikipedia.com, https://en.wikipedia.org/wiki/Edmund_FitzAlan,_9th_Earl_of_Arundel. Biography*: Eleanor of Lancaster, Countess of Arundel (sometimes called Eleanor Plantagenet; 11 September 1318 – 11 January 1372) was the fifth daughter of Henry, 3rd Earl of Lancaster and Maud Chaworth. Henry Beaumont, 3rd Baron Beaumont, (4 April 1340 – 25 July 1369), the first husband of Lady Margaret de Vere (d. 15 June 1398), the daughter of John de Vere, 7th Earl of Oxford by his wife Maud de Badlesmere. Henry and Margaret had one son, John Beaumont, 4th Baron Beaumont KG (1361-1396). On 5 February 1344 at Ditton Church, Stoke Poges, Buckinghamshire, she married Richard FitzAlan, 10th Earl of Arundel. His previous marriage, to Isabel le Despenser, had taken place when they were children. It was annulled by Papal mandate as she, since her father's attainder and execution, had ceased to be of any importance to him. Pope Clement VI obligingly annulled the marriage, bastardized the issue, and provided a dispensation for his second marriage to the woman with whom he had been living in adultery (the dispensation, dated 4 March 1344/1345, was required because his first and second wives were first cousins). Eleanor died at Arundel and was buried at Lewes Priory in Lewes, Sussex, England. Her husband survived her by four years, and was buried beside her; in his will Richard requests to be buried "near to the tomb of Eleanor de Lancaster, my wife; and I desire that my tomb be no higher than hers, that no men at arms, horses, hearse, or other pomp, be used at my funeral, but only five torches...as was about the corpse of my wife, be allowed." [S746] Wikipedia, online http://Wikipedia.com, http://en.wikipedia.org/wiki/Henry,_3rd_Earl_of_Lancaster. Biography*: Henry, 3rd Earl of Leicester and Lancaster (c. 1281 – 22 September 1345) was an English nobleman, one of the principals behind the deposition of Edward II of England. He was the younger son of Edmund Crouchback, 1st Earl of Lancaster, Earl of Leicester, who was a son of King Henry III by his wife Eleanor of Provence. Henry's mother was Blanche of Artois, Queen Dowager of Navarre. Henry was appointed "chief advisor" for the new king Edward III of England, and was also appointed captain-general of all the king's forces in the Scottish Marches. He was appointed High Sheriff of Lancashire in 1327. He also helped the young king to put an end to Mortimer's regency and tyranny, also had him declared a traitor and executed in 1330. In about the year 1330, he became blind. Matilda of Lancaster, (about 1310–1377); married William de Burgh, 3rd Earl of Ulster and had descendants. Biography*: Maud de Chaworth (2 February 1282–3 Dec 1322) was an English noblewoman and wealthy heiress. She was the only child of Patrick de Chaworth. Sometime before 2 March 1297, she married Henry, 3rd Earl of Lancaster, by whom she had seven children. Maud was the daughter of Sir Patrick de Chaworth, Baron of Kidwelly, in Carmarthenshire, South Wales, and Isabella de Beauchamp. Her maternal grandfather was William de Beauchamp, 9th Earl of Warwick. Her father, Patrick de Chaworth died on 7 July 1283. He was thought to be 30 years old. Three years later, in 1286, Isabella de Beauchamp married Hugh Despenser the Elder and had two sons and four daughters by him. This made Maud the half-sister of Hugh the younger Despenser. Her mother, Isabella de Beauchamp, died in 1306. Maud was only a year old when her father died, and his death left her a wealthy heiress. However, because she was an infant, she became a ward of Eleanor of Castile, Queen consort of King Edward I of England. Upon Queen Eleanor's death in 1290, her husband, King Edward I, granted Maud's marriage to his brother Edmund, Earl of Lancaster on 30 December 1292. Edmund Crouchback, 1st Earl of Lancaster, Earl of Leicester was the son of Eleanor of Provence and Henry III of England. He first married Aveline de Forz, Countess of Albemarle, in 1269. Later, in Paris on 3 February 1276, he married Blanche of Artois, who was a niece of Louis IX of France and Queen of Navarre by her first marriage. Blanche and Edmund had four children together, one of whom was Henry, who would later become 3rd Earl of Leicester and Maud Chaworth’s husband. Edmund Crouchback betrothed Maud to his son Henry, 3rd Earl of Lancaster. Henry and Maud were married sometime before 2 March 1297. Henry was probably born between the years 1280 and 1281, making him somewhat older than Maud, but not by much since they were either fourteen or fifteen-years-old. Since Maud inherited her father’s property, Henry also acquired this property through the rights of marriage. Some of that property was of the following: Hampshire, Glamorgan, Wiltshire, and Carmarthenshire. Henry was the nephew of the King of England, as well as being closely related to the French royal family line. Henry's half-sister Jeanne (or Juana) was Queen of Navarre in her own right and married Philip IV of France. Henry was the uncle of King Edward II's Queen Isabella and of three Kings of France. He was also the younger brother of Thomas (Earl of Lancaster) and first cousin of Edward II. Maud is often described as the "Countess of Leicester" or "Countess of Lancaster", but she never bore the titles as she died in 1322, before her husband received them. Henry was named "Earl of Leicester" in 1324 and "Earl of Lancaster" in 1327. Henry never remarried and died on 22 September 1345, when he would have been in his mid-sixties. All but one of his seven children with Maud outlived him. Blanche of Lancaster, (about 1302/05–1380); Maud’s eldest daughter was probably born between 1302 and 1305, and was named after her father’s mother Blanche of Artois. Around 9 October 1316, she married Thomas Wake, the second baron Wake of Liddell. Blanch was about forty-five when Thomas died, and she lived as a widow for more than thirty years. She was one of the executers of her brother Henry’s will when he died in 1361. Blanche outlived all her siblings, dying shortly before 12 July 1380 in her seventies. Born in the reign of Edward I, she survived all the way into the reign of his great grandson Richard II. Henry of Grosmont, 1st Duke of Lancaster, (about 1310–1361); Maud’s only son Henry was usually called Henry of Grosmont to distinguish him from his father. He was one of the great magnates of the fourteenth century, well known and highly respected. He took after his father and was well-educated, literate, and pious; he was a soldier and a diplomat. Henry produced his own memoir "Le Livre de Seyntz Medicines", which was completed in 1354. At one point, Henry of Grosmont was considered to be the richest man in England aside from the Prince of Wales. He emerged as a political figure in his own right within England: he was knighted and represented his father in Parliament. He married Isabella, daughter of Henry, Lord Beaumont. His daughter Blanche was betrothed and eventually married to the son of Edward III, John of Gaunt. In 1361, Henry was killed by a new outbreak of the Black Death, leaving John of Gaunt his inheritance and eventually his title through his daughter Blanche. Maud of Lancaster, Countess of Ulster, (c. 1310 – 5 May 1377). There is some discrepancy as to when Maud died. She married William de Burgh, 3rd Earl of Ulster in 1327. They had one child, Elizabeth de Burgh, who was born 6 July 1332. Eleven months after the birth of their child, Earl William was murdered at “Le Ford” in Belfast, apparently by some of his own men. The countess Maud fled to England with her baby and stayed with the royal family. In 1337, Maud of Lancaster managed to ensure that the Justiciar of Ireland was forbidden to pardon her husband’s killers. She fought for her dower rights and exerted some influence there. She remarried in 1344 to Ralph Ufford and returned to Ireland, where she had another daughter, Maud. After her second husband fell ill in 1346, she again returned to England. Maud of Lancaster died on 5 May 1377. Joan of Lancaster, (about 1312–1345); married between 28 February and 4 June 1327 to John de Mowbray, 3rd Baron Mowbray. John’s father was executed for reasons unknown, and young John was imprisoned in the Tower of London along with his mother Alice de Braose until late 1326. A large part of his inheritance was granted to Hugh Despenser the Younger, who was his future wife’s uncle; however, he was set free in 1327 before the marriage. Joan of Lancaster probably died 7July 1349. Joan and John, 3rd Lord Mowbray had six children. Isabel of Lancaster, Prioress of Amesbury, (about 1317–after 1347); One of the youngest daughters of Maud and Henry, she lived quietly, going on pilgrimages and spending a lot of time alone. She also spent a great deal of time outside the cloister on non-spiritual matters. Her father had given her quite a bit of property, which she administered herself. She owned hunting dogs and had personal servants. She used her family connections to secure privileges and concessions. Eleanor of Lancaster, (1318- Sept. 1372); married John Beaumont between September and November 1330. Eleanor bore John a son, Henry, who married Margaret de Vere, a sister of Elizabeth and Thomas de Vere, Earl of Oxford. John Beaumont was killed in a jousting tournament in Northampton on 14 April 1342. Eleanor then became the mistress of Richard FitzAlan, 10th Earl of Arundel, who was married to her first cousin Isabel, daughter of Hugh Despenser the Younger. Richard obtained a divorce from the Pope and married Eleanor on 5 February 1345 in the presence of Edward III. They had five children together, three sons and two daughters. Eleanor died on 11 January 1372. Biography*: Edmund Crouchback (16 January 1245 – 5 June 1296) was the second surviving son of King Henry III of England of the House of Plantagenet and Queen Eleanor of Provence. In his childhood he had a claim on the Kingdom of Sicily, but he never ruled there. In 1265 he was granted all the lands of Simon de Montfort and from 1267 he was titled Earl of Leicester. In that year he also began to rule Lancashire, but he did not take the title Earl of Lancaster until 1276. Between 1276 and 1284 he was also Count of Champagne and Brie, governing those counties in right of his second wife, Blanche of Artois, until her daughter from a previous marriage came of age. His nickname, "Crouchback" (meaning "crossed -back"), refers to his participation in the Ninth Crusade. Edmund was born in London. He was a younger brother of Edward I of England, Margaret of England, and Beatrice of England, and an older brother of Katherine of England. In 1255 he was invested ruler of the Kingdom of Sicily and Apulia by the Bishop of Romania, on behalf of Pope Innocent IV. In return his father undertook to pay the papacy 135,541 marks and fight a war to dislodge Manfred of Sicily from the kingdom. Upon Innocent's death, Pope Alexander IV confirmed Edmund's grant of Sicily. Henry's barons refused to contribute to what they called the "Sicilian business" and ultimately Henry was only able to pay 60,000 marks. Stephen Runciman says the grant of the kingdom was revoked by Pope Alexander IV on 18 December 1258; Baines and Harland state that this occurred in 1263 under Pope Urban IV. Edmund renounced his claim to the crown of Sicily. At about the same time Edmund was granted Sicily, he was made Earl of Chester. In 1263, the Earldom of Chester was transferred to his elder brother Edward, who required the palatinate income. Edmund soon obtained, however, important possessions and dignities, for soon after the forfeiture of Simon de Montfort, 6th Earl of Leicester on 25 October 1265, Edmund received the Earldom of Leicester and later that of Lancaster. He was granted the honour of the Stewardship of England and the lands of Nicolas de Segrave. He also acquired the titles and estates of Lord Ferrers, that included the earldom of Derby, and the Honour of Hinckley Castle. In 1267 he was granted the lordship of Builth Wells in opposition to the then holder, Llywelyn ap Gruffudd (the last prince of an independent Wales). To help him conquer the land he was also granted his elder brother's lordships of the Trilateral of Skenfrith, Grosmont and White Castle together with Monmouth. After the civil war in 1267, he was appointed High Sheriff of Lancashire. Henry III created his second son Earl of Leicester in 1267, granting the honour and privileges of that city. The following year, he was made Constable of Leicester Castle, a royal possession in the king's name. By now Crouchback had a reputation for being a ruthless and ferocious warrior, but he was not in England fighting de Montfort. In 1271 he accompanied his elder brother Edward on the Ninth Crusade to Palestine. Some historians, including the authors of the Encyclopædia Britannica article on him, state that it was because of this that he received the nickname Crouchback (which means "cross back") indicating that he was entitled to wear a cross stitched into the back of his garments. Edmund remained loyal to his brother, Edward I, who confirmed the Charter grants of 1265, 1267, and 1268-9, in a document of Inspeximus in 1284, and by parliament in the Great Charter of Leicester. He fequently acted as an ambassador abroad. In 1291, he was sent as Governor of Ponthieu, on behalf of his second wife, Blanche of Artois. On his return from the Crusade of 1271-2 he seems to have made Grosmont Castle his favoured home and undertook much rebuilding there. His son Henry, 3rd Earl of Lancaster was apparently born there in 1281. Edmund's duty to the church included the foundation of the Nuns of Clara, Minories, at St Aldate's. In 1291, his estate paid for the establishment for the Chapel of Savoy, in memory of his mother, at St Clement Danes. Filial piety was part of the chivalric code of an honourable knight. He was a generous benefactor to the monastery of Grace Dieu in Leicestershire, and the nuns at Tarrant Crawford. He also helped establish a major Grey friars monastery at Preston in the duchy of Lancaster. In 1281 he supervised the construction of Aberystwyth Castle for King Edward I to subjugate the Welsh. The next year he accompanied Roger Mortimer on campaign against Llywelyn, defeating and capturing the prince. He took an army to Bordeaux for his brother. Amongst the nobles was the Earl of Lincoln and 26 banneret knights. During the siege of Bayonne the English ran out of money, so the army melted into the countryside. Broken-hearted the warrior-prince Edmund Crouchback died on 5 June. His body was carried to England and was interred on 15 July 1296 at Westminster Abbey, London. Edmund married (1st) 8 April 1269 to Aveline de Forz, the daughter of William de Forz, 4th Earl of Albemarle and Isabella de Fortibus, Countess of Devon. She died just 4 years after the marriage, at the age of 15, and was buried at Westminster Abbey. The couple had no children, though some sources believe she may have died in childbirth or shortly after a miscarriage. Biography*: Robert I (25 September, 1216 – 8 February 1250), called the Good, was the first Count of Artois, the fifth (and second surviving) son of Louis VIII of France and Blanche of Castile. He received Artois as an appanage, in accordance with the will of his father (died 1226) on attaining his majority in 1237 (aged twenty-one). In 1240 Pope Gregory IX, in conflict with the Emperor Frederick II, offered to crown Robert as emperor in opposition to Frederick, but the French count refuse to pretend to such a title. On 14 June 1237 Robert married Matilda, daughter of Henry II of Brabant and Marie of Hohenstaufen. Robert II (1250–1302), who succeeded to Artois after Robert I was killed in Egypt during the Seventh Crusade, led by his brother Louis IX of France. Biography*: Matilda of Brabant (14 June 1224 – 29 September 1288) was the eldest daughter of Henry II, Duke of Brabant and his first wife Marie of Hohenstaufen. Blanche of Artois (1248 – 2 May 1302). Married first Henry I of Navarre and secondly Edmund Crouchback, 1st Earl of Lancaster. Robert II, Count of Artois (1250 – 11 July 1302). Jacques I of Leuze-Châtillon (died 1302, Battle of the Golden Spurs), first of the lords of Leuze, married Catherine de Condé and had issue; his descendants brought Condé, Carency, etc. into the House of Bourbon. Biography*: Margaret Wake, suo jure 3rd Baroness Wake of Liddell and Countess of Kent (c. 1297 – 29 September 1349) was the wife of Edmund of Woodstock, 1st Earl of Kent, the youngest surviving son of Edward I of England and Margaret of France. She was the daughter of John Wake, 1st Baron Wake of Liddell, (son of Baldwin Wake and Hawise de Quincy) and Joan de Fiennes. By her father, she was descended from Llywelyn the Great, Prince of Gwynedd and Joan, Lady of Wales, the illegitimate daughter of John I of England. Her mother, Joan de Fiennes, was a daughter of William de Fiennes and Blanche (Lady of Loupeland) de Brienne. She was a sister of Margaret de Fiennes, making Wake a cousin of Roger Mortimer, 1st Earl of March. Joan de Fiennes also descended from Emperor Jean de Brienne and Berengaria of León, herself the granddaughter of Eleanor of England, Queen of Castile. Margaret married John Comyn (c. 1294-1314) around 1312, son of the John Comyn who was murdered by Robert the Bruce in 1306. Her husband John died at the Battle of Bannockburn, and their only child, Aymer Comyn (1314–1316) died as a toddler. She married for a second time, to Edmund of Woodstock, 1st Earl of Kent. They received a dispensation in October 1325, and the wedding probably took place at Christmas. Through her marriage to Edmund of Woodstock (who was executed for treason in 1330), she was the mother of two short-lived Earls of Kent, of Margaret and Joan of Kent (wife of Edward, the Black Prince). The pregnant Margaret and her children were confined to Salisbury Castle, and her brother Thomas Wake, 2nd Baron Wake of Liddell was accused of treason but later pardoned. When King Edward III of England reached his majority and overthrew the regents, he took in Margaret and her children and treated them as his own family. She succeeded briefly as Baroness Wake of Liddell in 1349, but died during an outbreak of the plague that autumn. Margaret and Edmund's descendants include King Henry VII and queen consorts Anne Neville, Elizabeth of York, and Catherine Parr. Margaret is a supporting character in the Karen Harper historical fiction novel The First Princess of Wales, which gives a fictional depiction of her daughter Joan of Kent's life at the English court. Biography*: John Wake, 1st Lord Wake (1268 - c.?March 10, 1300) was created baron by writ of summons to Parliament on June 24, 1295. His father was Balwin Wake and his mother was Hawise de Quincy. John Wake, 1st Lord Wake was born in 1268. He was the son of Baldwin Wake and Hawise de Quincy. He campaigned in Gascony between 1288 and 1297, then he campaigned against the Scots between 1297 and 1300. To this he was appointed Joint Captain of March of Scotland in Cumberland and Westmoreland in 1297. He fought at the Battle of Falkirk (1298). He married Joan de Fenes/Fiennes before September 24, 1291. She was allegedly daughter of Sir John FitzBernard, of Kingsdown, Kent or William de Fenes/Fiennes, a Spanish count, and Blanche de Brienne, Dame de La Loupelande. Joan de Fiennes was possibly a relative of Edward I of England. She died just prior to October 26, 1309. Through his mother, John Wake, 1st Baron Wake of Liddell was a great-great-grandson of King John of England. He was great-grandfather of Richard II of England. Wake died c.?March 10, 1300. John Wake died between 1320 and 1349. Thomas Wake, 2nd Lord Wake born c.?March 20, 1297/98, died between 30 May 30, 1349 and May 31, 1349. [S746] Wikipedia, online http://Wikipedia.com, http://en.wikipedia.org/wiki/John_Wake,_1st_Baron_Wake_of_Liddell. [S746] Wikipedia, online http://Wikipedia.com, https://en.wikipedia.org/wiki/Blanche_de_Brienne,_Baroness_Tingry. Biography*: Baldwin Wake was born circa 1238. He was the son of Hugh Wake and Joan de Stuteville. He married, firstly, Ela de Beauchamp, daughter of William de Beauchamp and Ida Longespée. He married, secondly, Hawise de Quincy, daughter of Robert de Quincy, Lord of Ware and Helen ferch Llywelyn, on 5 February 1267. He died circa 10 February 1281/82. Biography*: Alan la Zouche, 1st Baron la Zouche of Ashby (9 October 1267 – shortly before 25 March 1314) was born at North Molton, Devonshire, the only son of Roger La Zouche and his wife, Ela Longespee, daughter of Stephen Longespee and Emmeline de Ridelsford. He received seisin of his father's lands after paying homage to the king on October 13, 1289. Alan was governor of Rockingham Castle and steward of Rockingham Forest. Alan La Zouche died without any sons shortly before at the age of 46, and his barony fell into abeyance among his daughters. "Alan son and heir of Roger la Zusche alias la Zuch, la Souche. Writ to Peter Heym and Robert de Radington, to enquire whether the said Alan, who is in the king's wardship, is of full age, as he says, or not, The eve of St. Margaret (20 June), 17 Edw. I. The said Alan, who was born at North Molton and baptized in the church there, was 21 on the day of St. Denis, 16 Edw. I. The Abbot of Lyleshull ( Lilleshall Abbey in Shropshire, to which he gave the advowson of North Molton Church in 1313) says the said Alan was born in Devon on the feast of St. Denis, and was 22 at that feast last past, and he knows it because he was keeper of a grange of Alan's father at Assheby four years ago, and knew from his father and mother that he was then 18. The prior of Repindon agrees, and knows it because his predecessor was created prior in the same year and was prior for twelve years, and he himself has now been prior for ten years. The prior of Swaveseye agrees, for he has been prior for twenty years, and saw him (Alan) before his creation when he was 2 years old. The prior of Ulvescroft agrees, for he has enquired from religious men, and especially from the nuns of Gracedieu who dwell near Alan's father's manor of Assheby. Brother William Ysnach of Gerendon agrees, for he sued the pleas of the house for nearly twenty-two (?) years, and Alan was born at the feast of St. Denis preceding. Geoffrey prior of Brackele agrees, for he was always with Alan's ancestors and ... twenty-four years ago, and within two years following Alan was born. Richard le Flemyng, knight, (probably of Bratton Fleming) agrees, and knows it from the wife of William de Raleye (probably of Raleigh, Pilton) who nursed Alan. John Punchardon, knight, (probably of Heanton Punchardon) agrees, for he held his land for such a time. Alfred de Suleny, knight, agrees, for his firstborn son was born on the same day. John de Curteny, knight, (i.e. Courtenay) agrees, for his mother died at Easter before Alan was born. William (?) de Sancto Albino, knight, agrees, for his brother gave him certain land, which he has held for twenty-one years, and one year previously Alan was born. William L'Estrange (Latinised as "Extraneus"), knight, agrees, for his (Alan's ?) father made him a knight sixteen years ago last Christmas, when Alan carried the sword before him, and was then 6 years old, except between Christmas and St. Denis. Robert de Crues, knight, agrees, for he has a daughter of the same age. Henry la Zuche, clerk, agrees, for he is his uncle, and likewise knows it from him who was at that time parson of the church of Hamme. Walter parson of Manecestre agrees, for the church of Karlingford in Ireland was given to him nearly twenty-two years ago, and when the news came to him in Devon Alan's mother lay in childbed. Robert parson of Pakinton agrees, for he was instituted into his vicarage at the Purification last past now twenty-two years ago, and Alan was born at the feast of St. Denis following. Alan was in Gascony with King Edward I of England in October 1288, when he was one of the hostages given by the king to Alfonso of Aragon for the fulfillment of certain agreements. He was in Scotland in the King's service in June 1291. In April 1294 he had a writ of protection from the King when he travelled overseas with the King's daughter, Eleanor of Bar. He served in Gascony in 1295 and 1296, and was present at the action around Bordeaux on 28 March 1296, when his standard bearer was captured by the French. In 1297 he was summoned for service in Flanders, and attended Councils in Rochester and London in that year. He was summoned for service against the Scots in 1297-1313. He fought in the Vanguard at the Battle of Falkirk on 22 July 1298. King Edward's army at that battle consisted of 12,000 infantry, including 10,000 Welsh, and 2,000 cavalry. William Wallace, the Scottish leader accepted battle in a withdrawn defensive position. Wallace had few cavalry and few archers; but his solid "schiltrons" (circles) of spearmen were almost invincible. The armoured cavalry of the English vanguard were hurled back with severe losses. Edward brought up his Welsh archers in the intervals between the horsemen of the second line, concentrating their arrows on specific points in the Scottish schiltrons. It was into these gaps that the English knights forced their way, and once the Scottish order was broken the spearmen were quickly massacred. "Sa rouge baniere a bezants" (as re-stated in modern French) "his red banner bezantée", is the description of the coat of arms he bore at the siege. He was summoned to Edward II's coronation on 18 January 1307/08. In December of that year he had a protection to go on a pilgrimage to Santiago de Compostela. He was the Constable of Rockingham Castle and the Keeper of the forests between the bridges of Oxford and Stamford. Biography*: From 1242 to 1243 he did military service in Gascony. He held the office of Justice of Chester and the four cantrefs of North Wales in 1250. He was Deputy under Prince Edward from February 1253/54 to 1255. He held the office of Justiciar of Ireland from 1256 to 1258. He held the office of Constable of Northampton Castle between 1261 and 1263. He held the office of Sheriff of Northamptonshire between 1261 and 1264. He held the office of Constable of Rockingham Castle between 1261 and 1264. He held the office of Justice of the Forests south of Trent between 1261 and 1264. He held the office of Constable of the Tower of London from 1267 to 1268. He held the office of Constable of Northampton Castle between February 1267 and June 1267. Alan la Zouche (or de la, also Zouch) Baron Zouche (d. 1270) was an Anglo-Norman nobleman and soldier. The surname "de la Zouch, de la Zouche" may derive from de la ouche, i.e. ouche: nf (feminine noun) – 1: vieilli (aged); jardin potager ou planté d'arbres fruitiers, près de la maison (potager/kitchen garden or orchard near the house); 2: terrain fertile (fertile land). He was the son of Roger de la Zouche and the grandson of Alan de la Zouche. This elder Alan, the first of the family to be established in England, was a younger son of ‘Galfridus vicecomes,’ that is, in all probability of Geoffrey, viscount of Porhoet in Brittany (d. 1141); his elder brother, Eudes de Porhoet, was for a few years count of Brittany, but with a disputed title, and his uncle, also named Alan, was founder of the viscounty of Rohan. Under Henry II Alan de Porhoet, or de la Zouch, established himself in England, and married Adeliza or Alice de Belmeis, sole heiress of the house of Belmeis [cf. Belmeis, Richard de], her inheritance including Tong Castle in Shropshire, Ashby (afterwards called Ashby-de-la-Zouch) in Leicestershire, North Molton in Devonshire, and other lands in Cambridgeshire and elsewhere. As her husband, Alan de la Zouch became an important personage at Henry II's court. Their sons, William de la Zouch (d. 1199) and Roger de la Zouch (d. 1238? ), succeeded in turn to these estates. Roger's Breton connection was almost fatal to him in 1204, but he managed to regain John's favour, and devoted himself to that king to the last. In the first year of Henry III's reign he was rewarded by receiving grants of the forfeited estates of his kinsmen, the viscounts of Rohan. He died before 3 November 1238. On 15 June 1242 Alan was summoned to attend the king Henry III with horses and arms in Gascony. He was at La Sauve in October, at Bordeaux in March and April 1243, and at La Réole in November. Before 6 August 1250 Zouch was appointed justice of Chester and of the four cantreds in North Wales. Matthew Paris says that he got this office by outbidding his predecessor, John de Grey. He offered to pay a ferm of twelve hundred marks instead of five hundred. Zouch boasted that Wales was nearly all reduced to obedience to the English laws, but his high-handed acts provoked royal interference and censure. He continued in office as the Lord Edward's deputy after the king's grant of Chester and Wales to his eldest son. Ireland had been among the lands which Edward had received from Henry III in 1254. In the spring of 1256 Zouch was sent to there on the service of the Lord Edward, and soon afterwards he was appointed justiciar of Ireland under Edward, his first official mandate being dated 27 June 1256. In 1257 he was still in Ireland. On 28 June 1258 he received a mandate from the king, now under the control of the barons, not to admit any justice or other officer appointed by Edward to Ireland unless the appointment had the consent of the king and the barons. However, he ceased to hold office soon after this, Stephen Longespee being found acting as justiciar in October 1258. During the barons' wars Zouch adhered to the king. He was on 9 July 1261 appointed sheriff of Northamptonshire, receiving in October a letter from the king urging him to keep his office despite any baronial interlopers. He remained sheriff until 1264, and sometimes ignored the provisions of Magna Carta by acting as justice itinerant in his own shire and also in Buckinghamshire and Hampshire. In 1261 he was also made justice of the forests south of Trent, and in 1263 king's seneschal. In April 1262 he held forest pleas at Worcester. On 12 December 1263 he was one of the royalist barons who agreed to submit all points of dispute to the arbitration of Louis IX. According to some accounts he was taken prisoner early in the battle of Lewes by John Giffard. He escaped almost immediately and took refuge in Lewes Priory, where he is said to have been found after the fight disguised as a monk. In the summer of 1266 he was one of the committee of twelve arbitrators appointed to arrange the terms of the surrender of Kenilworth Castle. On 23 June 1267, after the peace between Henry III and Gilbert de Clare, 8th Earl of Gloucester, he was appointed warden of London and constable of the Tower. He continued in office until Michaelmas, whereupon his tenure was prolonged until Easter 1268. In 1270 Zouch had a suit against Earl Warenne with regard to a certain estate. On 19 June the trial was proceeding before the justices in banco at Westminster Hall, and Zouch seemed likely to win the case. He was murderously attacked by Earl Warenne and his followers. Roger, his son, was wounded and driven from the hall; Alan himself was seriously injured and left on the spot. He was still surviving when, on 4 August, Warenne made his peace with the crown and agreed to pay a substantial compensation to the injured Zouches. He died on 10 August, and on 20 October his son Roger received seisin of his estate. Zouch was a benefactor of the Knights Templars, to whom he gave lands at Sibford, and to the Belmeis family foundation of Buildwas Abbey, after having carried on protracted lawsuits with that house. Roger de la Zouch, married Ela Longespee, daughter of Emelina, countess of Ulster, was summoned to parliament, and died in 1285, being succeeded by his son. Alan la Zouche, 1st Baron la Zouche of Ashby, then aged 18, who died in 1314, being also summoned to parliament between 1297 and his death. Maud, who married Robert de Holland, 1st Baron Holand. Between the descendants of these two ladies the estates were divided.